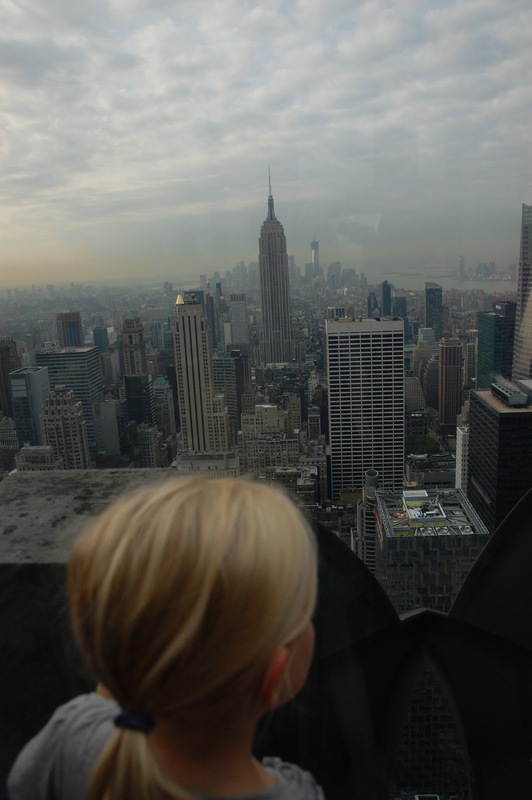 from the top of the Rockefeller Center. A taste of culture, a snapshot into another style of living, is what we enjoyed experiencing with our girls last week (Landis stayed home with his grandparents). We may not have even stood on the steps of a museum while we were there, but I have to say it was kind of intentional. We've been to museums, they have their place, but really what we wanted was to explore, walk, experience different kinds of transportation, people watch, etc. There's so much learning in just absorbing what you see, trying to figure out if so-and-so was a tourist or a local, learning which streets to walk on to avoid the crowds, figuring out that tourists walk with their heads pointing towards the sky, while locals keep their heads buried in their chests, either totally oblivious of what's around because they're so used to it, or just trying not to make eye contact with the millions of tourists, who knows. We delighted in the memories made, the colors of fall, spending a whole day walking the streets in the rain with cheap ol' umbrellas, sipping single cup drip coffee on top of Chelsea Market, eating our Hale & Hearty soup, riding bikes in Central Park, gripping our children's hands soooo tight while riding the subways, using the secret stair well that no one else in the hotel seemed to use (who instead waited for the ridiculously slow elevators--we have no time for that people! ), sharing a tire swing with a sweet little city girl (they really are hospitable, those locals), making fun of the angry cab drivers (who aren't really angry at all, it's just a way of life, I think), finding the hidden little coffee/pastry shops before the other tourists wake up, seeing my sweet girls enamored by Annie and Mary Poppins, their first Broadway shows, and more. The memories keep popping up, such a sweet time with my sweet family. My heart goes out to those right now who are having to deal with that hurricane--I can't believe we barely beat it home! Ah looks like you had a great time and you went at a great time. So glad you're not there now! Was this a work combined vaca trip or just a vaca trip? Love the shot from the empire state bldg! Wonderful post! Totally jealous! :) And no kidding about the hurricane, the things you saw likely won't look like that again for awhile... you would need your swimsuit in the subways right now. Eek! What great memories for the girls! And so wise for you and Luke to just enjoy the time with them and not try to pack too much in. We learned that lesson quickly! !